Everyone wishes for a concrete driveway that will last the rest of their lives. However, there are certain elements that could be harmful, causing unpleasant damage to the slab itself. 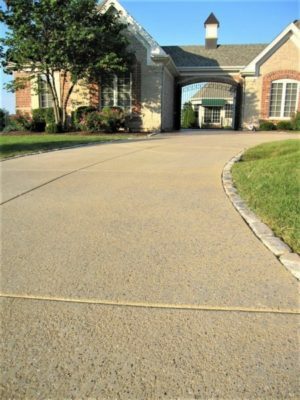 Whatever damage is acquired, homeowners dread the costs that come with concrete driveways repairs. Before you hire a contractor, it is highly recommended to have the driveway assessed so as to determine the proper repair option and how much it could possibly cost. Once you have determined what caused the damaged, you’d be surprised at how many repair options out there are affordable enough to fit your tight budget. Resurfacing is the practical alternative to replacing the entire concrete driveway. Removing the current slab and pouring a new mix of concrete is not only expensive, it also requires a longer installation time and involves more tedious and invasive work. Simply replacing the damaged surface with a coating or overlay is enough to give the driveway a new look and better function. Popular resurfacing options are stamped overlay and spray knockdown finish. Concrete driveway slabs have a tendency to shift and sink. This is often caused by moving or settling soil underneath. Instead of removing the slab and compacting the subgrade again before repouring a new driveway, there is a more affordable option: slabjacking. The process involves drilling a hole in the sunken area of the slab and then injecting a filler until the slab is lifted back into proper alignment. Cracking is the most common type of concrete damage. While most cracks can be repaired with fillers and sealants, some are recurring. Working cracks are caused by regular movement underneath the slab. Sealing it will only be a temporary fix and the crack will reappear. The best and more inexpensive solution is to score or engrave along the crack and include it in the design. This way, the crack is left open and the slab has enough room to move naturally. Ugly stains are unavoidable, especially on a driveway. Oil and grease stains can be quite an eyesore. No matter how hard you scrub, stains will barely leave the surface. Adding color to the slab is the best way to cover up or disguise stubborn stains. Concrete stains penetrate past the surface and leave a color that is vibrant and long-lasting. This is also ideal for covering up any discoloration that concrete slabs naturally go through.